Access Profiles, Inc.: Do You Need Laws to tell You to Do What’s Right? 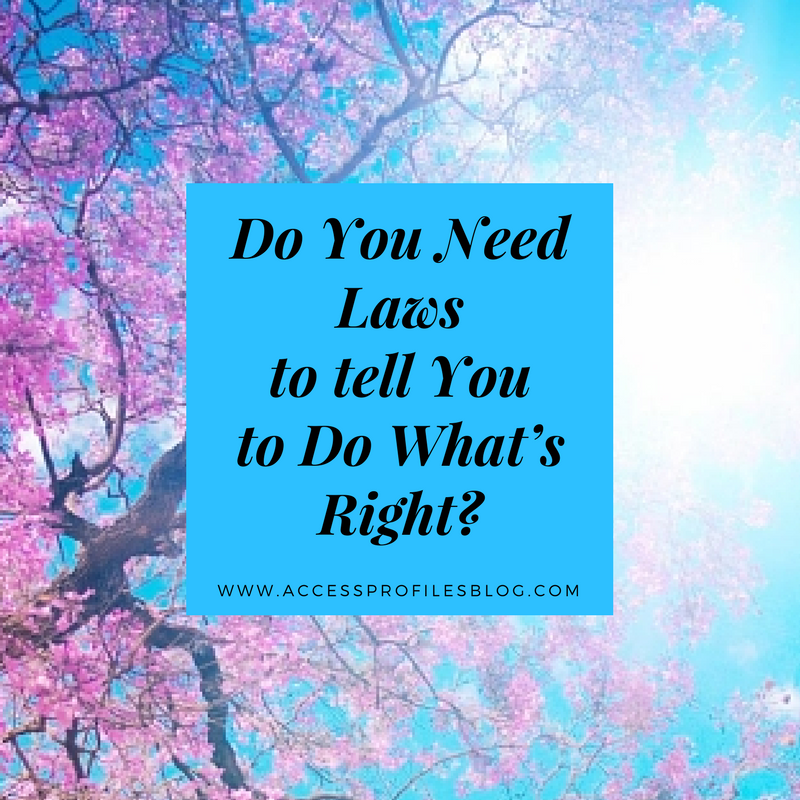 Do You Need Laws to tell You to Do What’s Right? Laws provide guidelines for how we should treat each other and the world around us. They are also designed to protect us from those who choose to do harm. Sadly, we can’t always count on people doing the right thing. That is why laws are also used to punish those who break them. But, should we really need laws and regulations to tell us to do what is right? Many of us recognize the need for doing what is right in our personal lives. Few would argue that, except under the most dire circumstances, it is wrong to kill another human being. As people, we also rally when we see the need to protect those that can’t protect themselves. Essentially, we know how we should treat others, and most of us try to live our daily lives this way. But when it comes to the laws and regulations that govern our businesses, things can be less clear cut. Every time we elect a new president, or a new justice is appointed to the Supreme Court, laws and regulations that govern our businesses can change. Even voting in new local representatives can make a difference. There are some laws and guidelines that, to my mind, are simply the right way to do business. They focus on the fair treatment of our employees, from hiring to the workplace, and our impact on the environment. Currently, many of these laws and regulations focus on employee hiring and background check guidelines, especially for those applicants who have a criminal history. The biggest, and often most controversial of these, is “ban the box”. “At its most basic, ‘ban the box’ is the removal of the question or “box” on an application that asks whether the person has a criminal history. The belief is that by disclosing that (a criminal history) early in the application process, many are being automatically rejected”, excerpt from “Background Checks and Ban the Box ~ The Pendulum Swings”. The EEOC started the ball rolling by enacting guidelines recommending employers ban the box. Many states then followed suit. Even if this law didn’t exist, its spirit, giving people a second chance, is often the right thing to do. Along with individual assessments (find out more about them here), recognizing that people people are different, that they have their own unique experiences and stories to tell, is what makes us human. And hiring for our businesses this way makes sense. Other hiring legislation focuses on discrimination. 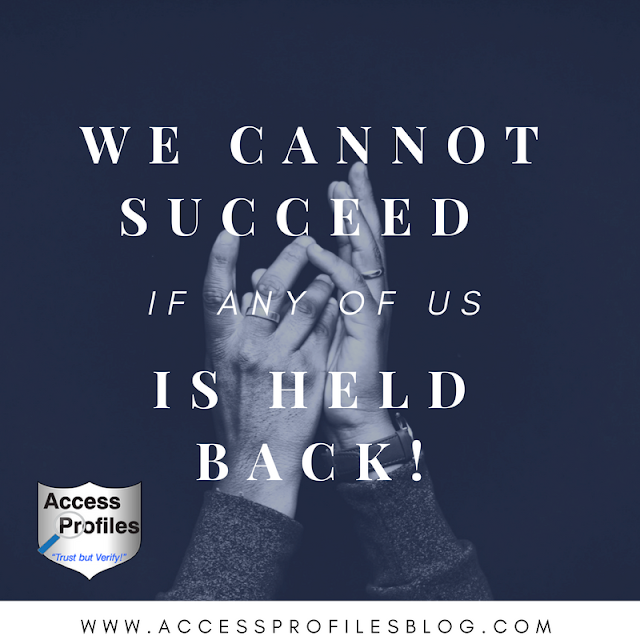 Hiring those of different races and genders, applicants with disabilities or of different sexual orientations, all currently fall under what is described as “protected classes”. Existing laws not only govern the hiring of these types of employees, but how we treat them in the workplace. Hiring policies that show, or even suggest, employment discrimination against protected groups can result in consequences for your Small Business. When we hire, we have the power to make a difference in someone’s life. For me, that is reason enough to do everything possible to make sure people are treated fairly. The problem of Equal Pay and Gender Wage Bias is also addressed in current legislation. Sadly, what should not be a novel concept, getting equal pay for equal work, is not always the reality. In many industries, women continue to make less than their male counterparts doing the same job. The ramifications of this impact not only women, but also their families. Learn more in “Discrimination ~ Gender Bias Keeps Us from Earning What We are Worth”. The EEOC (Equal Employment Opportunity Commission) and many states have addressed the issue of equal pay. The EEOC pushed for companies to release their pay data in the hopes of identifying those that are guilty of wage bias (when a new administration took office in 2017, this requirement lost steam). But some states continue the fight. Laws barring companies from asking salary history, ending pay secrecy, and enforcing “equal pay for equal work”, are all designed to if not eliminate, but lessen, the occurrence of wage bias. Find out more about these state laws here. There are also regulations that address the impact our businesses have on the environment. Manufacturers must lessen the amount of waste produced by their businesses. Chemical run-off into our waterways must fall within acceptable guidelines. Even recycling efforts are encouraged. The bottom line is, why should we need laws and regulations to force us to run our businesses ethically? Shouldn’t we simply want to do what is right? Choosing to hire as fairly as possible. Striving to achieve a more inclusive and tolerant workplace. Paying our employees the same for doing the same job at the same skill level. All these are not only good business, but are fundamentally right! How we treat our employees is a strong reflection on us as people, and it speaks volumes about our business. Recognizing that our employees matter, that no one is “less than” anyone else, should never come in question. Creating a welcoming workplace not only helps our employees, but it is good for our business. It will help us attract and keep top talent because word will spread and people will want to work there! When it comes to our environment, we need to remember that we are all part of one world. Doing what we can now to protect it makes sense. doing what is right should not! There will always be laws and regulations in place that concern our businesses. They will be designed to shape how we hire, how we run our workplace, and how we impact our world. And that is good for everyone! Please Comment and Share this post! Thanks! Subscribe Now and get new articles focused on You and Your Business. We invite you to find out more About Us and our Background Investigation & Applicant Services, Business Mentoring, and Security Consulting services too.